This is based on MissPrissy' s incubator with a few changes. This took me around three hours due to the fact that we have a million places to put and forget stuff. Cut hardware cloth to fit the bottom. Put band-aid on finger where hardware cloth stabbed you. Install pan under hardware cloth. Cut hardware cloth guard to shield chickies from electrical stuff. Let the incubator run overnight to get an idea of levels. 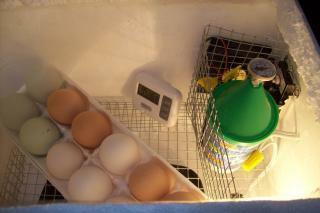 Adjust thermostat until the incubator reads steady at the temperature/humidity you want. To make this easier, set an open top quart jar of water in the incubator. 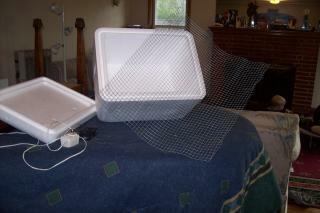 It serves as a "heat sink" and will help keep both temp and humidity steady. Fill Kiddie cup with water, insert instant read thermometer into top of kiddie cup. This tells you the interior temp of the eggs. Calibrate thermometer/hydrometer in bag of 1/2 cup salt and 1/4 cup water. Don't let the unit touch the salt and water mixture! After eight hours, it should read a humidity of 75%. 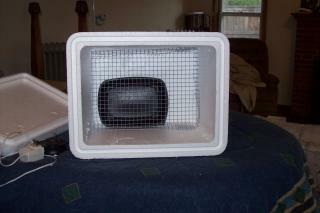 Put in incubator after calibration. When the levels hold steady, set eggs. I used an egg carton propped on its own lid so all I have to do to turn is lean it to the other side. Try not to candle every single day. Admit to no one that the spider thingies fascinate you to the point that you must gaze at them regularly. Cross fingers, be a basket case for 3-4 weeks, and join the ranks of hatchaholics. I loved your sense of humor, but would have loved some more in-progress pics and your wiring diagram. I would like s few more details on airing and how to's. But nice job.